A complete Post Medieval cast lead alloy circular unifaced token of Powell type 2. On one side are the raised initials C L . The other side is blank. The token measures 19.01 mm in diameter, 1.60 mm thick and weighs 2.8 grams, An identical token has been found in the same area PUBLIC-C80971. 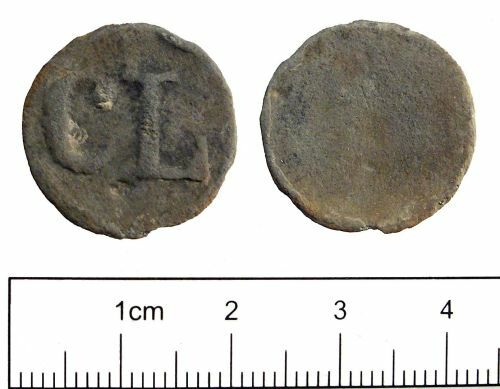 Lead tokens had a wide variety of uses and were made locally; they are therefore hard to date precisely but those with initials are thought to be Post Medieval in date (c.1500-1850 AD).